Course Description - This course provides educators opportunities to develop interactive websites and dynamic online activities to engage their students in the those practices and habits of mind described, such as asking questions and defining problems, developing and using models, planning and carrying out investigations, analyzing and interpreting data, using mathematics and computational thinking, constructing explanations and designing solutions, engaging in argument from evidence, and obtaining, evaluating, and communicating information. This course fosters the development of Technological Pedagogical Content Knowledge (TPCK) so that educators are prepared to use the web-based resources they develop to engage students and enhance learning. A required course for the Master of Arts degree in Science. Education. Enrollment restricted to students in the Master of Arts in Educational Technology program or with instructor permission. Methods of Evaluation - Performance is evaluated on the quality of contributions to CSCS activities (20%), as well as on the quality of student-developed CSCS investigations and websites (80%). Contribution to all in-class CSCS activities investigations - During class sessions, we will be engaged in a variety of CSCS Investigations dealing with concepts and principles in the sciences. Students are expected to participate in all these activities to experience their effectiveness from a student's perspective. Masters Program Website - Continue developing your masters program website which includes all work performed in all courses in your masters degree program. CSCS Investigations Website - Develop a CSCS (Computer Supported Collaborative Science) website which includes all of the CSCS activities performed in class, as well as personally developed CSCS activities that involve collaborative data analysis, collaborative resource development and continuous formative assessment. Classroom Website - Develop a website to be used in the teaching a scientific discipline Your website should include all of the interactive features discussed in the class. It must include a minimum of 80 pages, including a variety of resources s, including, but not limited to, the following: Interactive State Content Standards; links to useful resources, syllabi, semester plans, assignments, letter to parents, calendars, FAQ (Frequently Asked Questions), Department & school contact lists, Curricular material, class handouts, sample projects (student reports, artwork, lab reports, projects, posters), homework assignments, problem solutions, links to relevant resources, web quests, glossary (key words, root words, etc. ), study guides, help, department standards, interactive resources, wiki, blogs, academic- social networks, questionnaires & surveys (for formative assessment, gathering student data, etc,), multimedia teaching resources, animations, movies (procedures, activities, interviews, etc), diagrams, graphic organizers & concept maps, photos for use in class instruction (photos related to the subject you teach), Interactive documents, interactive maps. Your website should include analytics that allow you track usage. Editorial Work - Participation Provide continuous feedback regarding the status and quality of the websites developed by your editor.Respond to all editorial comments made by your editor on your work. Develop skills for designing and producing websites for teaching science. Vandergon, V., Herr, N.; Tippens, M.; Rivas, M.; d'Alessio, M., & Reveles, J. (2015). Collaborative data analysis. In Chao, L., Cloud-Based STEM Education for Improved Learning Outcomes to be published by IGI Global, Hershey, PA: IGI-Global Publishing. Herr, N., Rivas, M., Chang, T., Tippens, M., Vandergon, V., d'Alessio, M., & Nguyen-Graff, D. (2015) .Continuous formative assessment (CFA) during blended and online instruction using cloud-based collaborative documents. In Koç, S., Wachira, P., & Liu, X. (Eds. ), Assessment in Online and Blended Learning Environments. Charlotte, NC: Information Age Publishing. The Instructional Quality Commission approved the Draft Science Framework for California Public Schools for field review on June 20, 2016. Herr, N., & Rivas, M. (2014). Engaging Students in the Science and Engineering Practices of the Next Generation Science Standards (NGSS) with Computer Supported Collaborative Science (CSCS).Proceedings of the 12th Annual Hawaii International Conference on Education. 5-8 January, Honolulu, HI: HICE. Foley, B., Reveles, J., Herr, N., Tippens, M., d'Alessio, M., Lundquist, L., Castillo, K.,& Vandergon, V. (2014) . 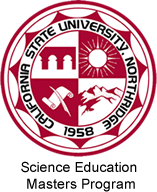 Computer Supported Collaborative Science (CSCS): An Instructional Model for Teaching the NGSS.Proceedings of the 2014 International Meeting of the Association for Science Teacher Education. New York: Springer-ASTE. Herr, N., Rivas, M., Foley, B., Vandergon, V., d'Alessio, M., Simila, G., Nguyen-Graff, D. & Postma, H. (2012). Employing collaborative online documents for continuous formative assessments. In P. Resta (Ed. ),Proceedings of Society for Information Technology & Teacher Education International Conference 2012 (pp. 3899-3903). Chesapeake, VA: AACE.